A WEST Belfast grandmother says she and her husband have been left “distracted” following the decision to stop her PIP (Personal Independence Payment). PIP, which replaced Disability Living Allowance (DLA), and its assessment process, has been heavily criticised by political representatives with many calling for an overhaul into how PIP interviews are carried out. 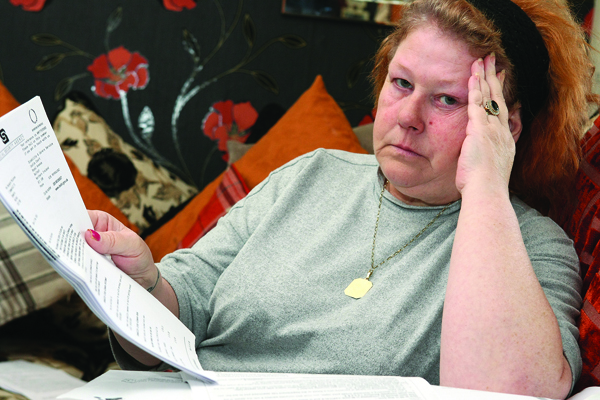 51-year-old Margaret McLarnon from Twinbrook told the Andersonstown News that she had been notified she would no longer receive her PIP allowance of £320 a month on April 12 and that this was to remain so following two reassessments of the decision. Margaret, who had been receiving the payment for crippling anxiety following two heart attacks, said that she was faced with no other choice but to challenge the decision at a tribunal, the date of which has yet to be set. “I suffered two heart attacks in the space of seven months in 2008 which just completely floored me,” explained Margaret, “I worked in Charles Hurst and Malone College as a cleaner but following the heart attacks I couldn’t work. Margaret said she started receiving DLA at the start of 2010 and had actually received a letter from the Department for Communities (DfC) saying it would continue until 2020, and “now there is nothing,” she said. Margaret also criticised the way in which her PIP assessment was carried out. “To be honest I thought I had done something wrong. It’s not my fault I have mental health problems. I was told to carry out a number of stretches, touch my toes, stand on my leg. I was asked how I got to the interview; I said my daughter brought me as I don’t take public transport due to a traumatic accident a number of years back. “I contacted the Andersonstown News as I wanted to get across that these assessors are diagnosing people’s health, mental stability, lifestyle and you are being judged on it. It’s not an opinion, they are making a judgement. Margaret spoke of how the loss of the PIP payment has resulted in financial hardship as the house phone, internet and Margaret’s mobile phone all have been disconnected. Margaret said her husband’s car is now stationary outside their Summerhill Place home as they cannot afford to fix it.